Each August, when I don't blog, I consider September: what inspires, provokes, interests me? In the first year or so, a flurry of opinions (for I'm never short) kept posts about dresses or earrings flowing. Going on four years later, I'm not so avid about things. My life has changed, from flat-out work to relatively retired, from owning a big house to living in a smaller condo. I buy much less, don't read loot blogs and am reluctant to post my own possessions. I am interested in value, in hearing about the things you've chosen, and showing some suggestions, so that what we buy serves us well and long. The word 'trend" makes me faintly suspicious. For fall, a quiet navy cashmere jacket appeals more than a wild fur chubby. In August, I read Cathy Horyn's NY Times piece on "The Five Things You Need for Fall". 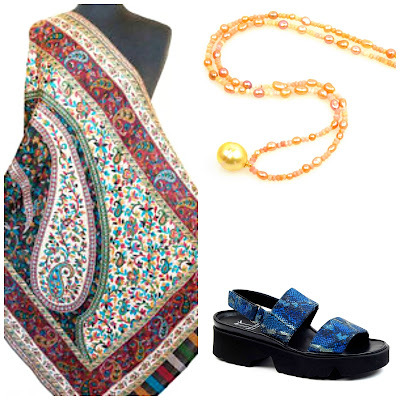 I hoped to be edified but emerged vexed; her list is "what fashion editors are ordering". I could get behind a few selections (black turtleneck, python boots), but unable to pre-order at Balenciaga (or just order, for that matter), I was hoping for ideas for smaller budgets and bigger figures. To give Horyn praise where it's due, I am mad for this pick, the Philip Lim leather-sleeved top. Oh yeah, sold out everywhere. - Perspectives: our behaviour, singly and jointly, issues and quandries. On my short list: solitude, friendship, the challenge of becoming an elder and the life-long duality of frugality and pleasure. The blog is addressed to women over 50, by one of 63 interested in celebrating age, rather than worrying about not looking it. Its patron saints are Molly Ivins and June Callwood, for their humanity and intelligence. Callwood once said, in a fashion feature, "I can't buy cheap clothes; as I get older, I expect to get poorer." That's classic Callwood, pointing out the social realities while modeling a chic suit. Here are a few value-worthy picks for the rentrée; what are yours? In August, absent from a screen most of the time, I was able to read for hours. I especially enjoyed Sarah Mazza's "Violette Nozière", a crime memoir and social history of 1930s Paris. Apt, then, to present a decidedly deco accessory, Eric Bompard's 1930's headband. I suspect it might not suit me when I try it on in Paris next month, but for those of you whom it would, I'd grab one. Hand-washable, cozy and insouciant. Price, €39. Horyn digs YSL's metal choker, but if you'd like a slightly less bold chain for less than $1,600 (and I would not want their billboard of a two-inch logo'd clasp, either), how about Alex Bittar's silver and crystal link necklace, $195 at Twist? Danier make this... thing. Is it a scarf? Stole? Vest? 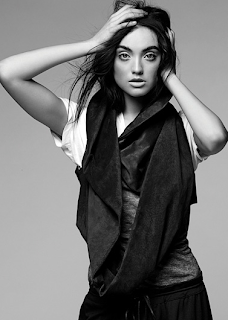 They call their supple swath the Awi suede scarf vest. 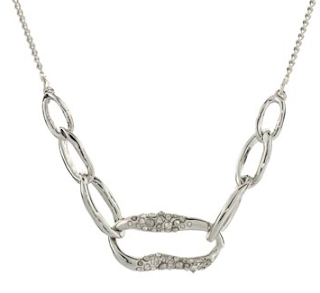 Over a simple v-neck, the piece makes an arresting accessory at any age, but is especially great on a grown woman. Part of Danier's new collaboration with designers Greta Constantine; if you want one, act fast. Python: Very big for fall and, like a glass of chablis, always a grace note. You could invest thousands, but here's a way to flash it for less: BCBGMaxAzria's python box clutch is a discreet fake, more durable than the sensitive snake–and on sale at Zappo's for $82. Size is a handy 8 in. x 5 in., with a removable shoulder chain, and the black/camel colourway goes with everything. If you are willing to put a little more skin in the game, Carlos Falchi's python clutch is real, and the bag is lined in suede. Price, $545 at Bloomingdale's. 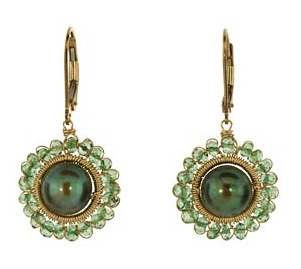 And the pearls: Dana Kellin blue-green 8mm pearl earrings set with crystals offer shimmery allure for $242. 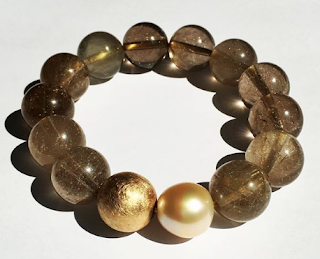 (I will not recommend soulless fake pearls, when genuine ones are available so reasonably.) These are a luxury for some, a bagatelle for others. So be it; they are worth the price. That's the Passage for you; welcome back! I posted number one on my list today but I think I am getting wiser, i love it but won't be buying something I will carry but twice a year. I too try to stay away form full blown trends, longevity is what concerns me now and with my 50th year coming in a three years time I am looking to the woman I will become and I'm really rather looking forward to it. I like your thinking and completely agree with what you said on my recent post, about people being careful NOT to go into debt on splurge, fun items. My post today is about a Chicos outfit I have had for about 20 years. I think we as bloggers do a great service when we can help others know ideas for stretching the budget and looking great! I might have to try the headband look, I think I would like it! As a woman who is close to your age and considering retiring in the next few years, I look forward to your finds and even more your thoughts on life. Greatly looking forward to reading your forthcoming posts. Love the Philip Lim, luckily I bought a jacket with leather sleeves last year so really pleased the look is continuing, even if it wasn't I would still love it. 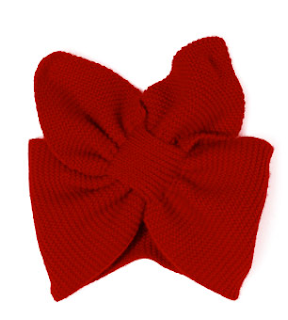 Will check out the Eric Bompard headband as they really suit me I have memories of buying one in Paris in the 80s. Thanks for the tip off. Fabulous rentrée, Duchesse! Those pearl earrings are stunning. I've really been looking forward to reading you again. Oh, and I was also mightily disappointed in Horyn's picks as well. Welcome back -- we've missed you. And hurrah for your Paris plans (altho' I anticipate another absence from us). I'm interested in the way you used your time away to re-focus what you want to do here. I've noticed for some time now that I'm increasingly less keen in blogs that focus on products, even those posts in blogs I like, and when I do What I Wore posts, I'm more pleased when I integrate items I've had for some time than when showing something new. A recent exception would be my new boots, but these meet your criteria. I look forward to following you along this newly-defined route. And I'm always happy to see June Callwood get her due. Welcome back and you have not disappointed with your post. Always a wise woman Duchesse and I am studying under your tutelage. I read several September issues and have found very little to tempt me. Like you I am content with less and am eyeing the financial house as retirement is looming! Welcome back. I hope you feel refreshed and revived. Who among us, at this stage, outside of fashion insiders, goes after trends? But a little bit of trendy is kind of fun. Bonjour Duchesse! It's so nice to have you back. The crime memoir sounds really good. I'm glad you'll be reserving more time for other projects but will look forward to your twice weekly posts. 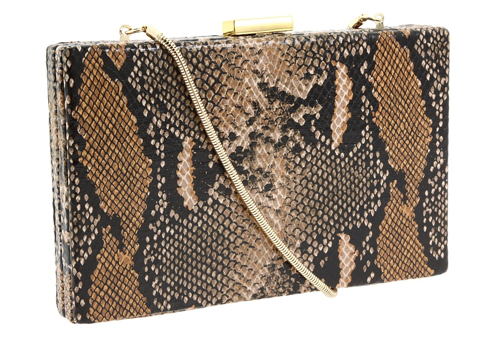 The snake clutch is kind of tempting, visually anyway. I wonder, if it can be worn with a softer look, like ponte di roma slacks and a jersey top, or if it has to be matched with equally structured clothes. So glad to have you back with your witty and thoughtful commentary. And, especially, your thoughts on pearls and jewelry. How much fun to have the opportunity to read your blog again. As a Texan, I can assure you that Molly Ivins is missed. I had the opportunity to hear her speak once and it was a very enjoyable evening. I'm not buying my usual fall wardrobe this year, but trying to make do with my already ample closet. I MAY have to buy a dress for a black tie wedding, but I expect that to be the extent of my fall acquisitions. I liked Deja Pseu's comment that she is looking for trends she would have purchased anyway. Bourbon: Though you are a mere child, I like your style! Pam: Sometimes I think I have to get rid of something I've had for so long (and did so when I moved) but a few rare items seem to never lose their allure. Northmoon: Thanks, I will write more about that and appreciate the encouragement. 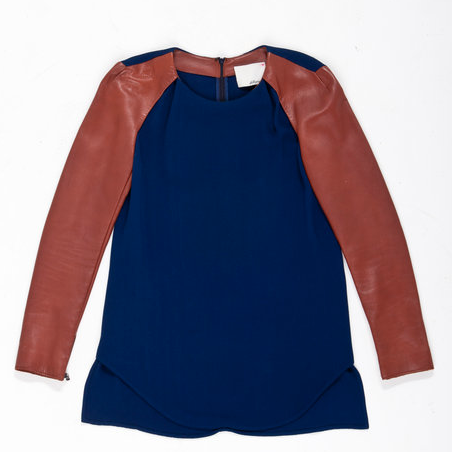 Chicatanyage: Anything with leather sleeves is very of the moment but also classic- the sweet spot! materfamilias: See remark to pseu; you two are boot babes par excellence! Knowing one's "accessory true love" is a route to value, because, if you really love something, you will likely wear it a lot, getting even more value from it. hostess: I think you are already very skilled at choosing what's just right for you; thanks! Seriously, reptile prints, like animal prints but a bit more refined, suit casually elegant clothes like you have described, or even jeans with boots or chic shoes. it does not work with the most casual (running shoes, etc.) which I know you will sense yourself. Sewing Librarian: I appreciate the kind words, and look forward to your comments. 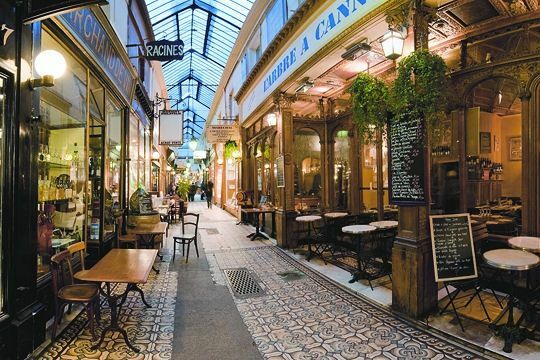 How long will your Parisian sojourn be? So exciting. Susan: A (big) branch of my family is Texan. Would have loved to see Molly. I would be panicked re black tie wedding, but my first thought would try to find an exquisite fabric and have a long skirt (or dress) made- which could shorten later as I so rarely need that level of formality. frugal: Sixteen days. It is important for Le Duc to swim happily in French, though perhaps not so essential now that we're in Montreal. But it makes a good excuse for the trip. 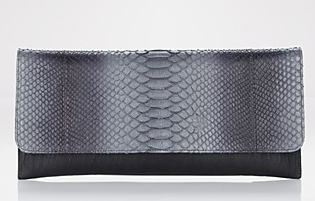 Not that I would be buying one, since snakes seriously creep me out, but I looked at the "python" clutch at Zappos. According to the only review posted, the purse won't even fit a lipstick! This may account for its being on sale. As far as fake pearls being "soulless," Jacqueline Kennedy's famous string of pearls was glass. It seemed to work for her. Living where I do, I'm afraid a shirt with long leather arms would make me very uncomfortable. It's too warm here for so many items that most of the people who read your blog are looking for. Unless I move to a colder climate, I'll probably never buy another winter coat. I only own the vintage 1994 model that sits mostly unworn in my closet because we'd planned a trip to Toronto for the MLA. The truth is, for the most part the styles no longer suit my body type or my budget, and I don't really need anything new. I'm thinking about buying some new scarves, by Missoni for Target, but depending on my mood, even that seems wasteful. I'd rather spend the money on travel or give more to charity. My longtime interest in clothing and fashion feels on the verge of turning purely theoretical. Glad to have you back. It sounds like you enjoyed your August! When are you going to Paris, and how long will you be there? I'm so envious, I loved it there and could go back in a heartbeat! Oh, my. I don't usually care about fine jewelry, because I inevitably loose things, but those green pearl earrings are going to make me change my mind. Ah, Bompard changes up the classic keyhole scarf as a headband, eh? Although his price is pretty reasonable for cashmere, if any other knitters should care to reproduce it in a less dear fiber, there are several free patterns for this well-loved design, including one from Martha Stewart. Or search on Ravelry for bowtie scarf/keyhole scarf. It goes back generations! wendeleh1: Perhaps you can find some blogs for women who live in different temperate zones from mine. As for the clutch, it is 8" x 5" and 1" deep. I think it will accommodate rather more than a lipstick. Jacqui: Sixteen days, in Oct.
Aunt Snow: I have found when I treasure something, I am more careful. It's the $30 sunglasses I lose continually. Someone: It's a take on the classic turban (but open at the top), a deliberate 1930s reference, according to the site. I can see how this would be an appealing DIY project. Welcome back :-) I've missed reading your posts. With everyone deep into Autumn planning, the industry, the glossy media circus and the blogosphere all waxing on the need and must have items for the fall... I've always hated it, for there are truly very few things we need. But it's nice to look at the trends and splurge occasionally. Hoping the investment will pay off in the end, when in fact it's just a giant lottery. Anyways, my thoughts and wardrobe remain in the summer for the present and until the temperatures drop to a solid 16 degrees Celsius I won't be packing away my linen! Glad to see you back, Duchesse; I always enjoy reading your posts. And apparently we have another thing in common besides our age, taste, and curly hair: I'm a longtime devotee of Molly Ivins too. Like Susan, I once had the pleasure of attending a book signing of hers here in TX. She was wonderful and I miss her greatly! How you have been missed, Duchesse, both online and here in Toronto! Glad to see you back, at least on my laptop screen, if not in the city. I look forward to your posts in the months to come. I'm off to Bordeaux & Paris later this month... can't wait! coffeeaddict: Agree! The trends are not really 'trends'; sometimes I imagine a group of people in the fashion industry somewhere spinning a wheel and going with whatever turns up, then decreeing them as trends. s. Have a wonderful trip; wish we would have been in Paris at the same time! Oh, I am so glad you are posting again! I loved the pearl earrings you showed. For fall I have found a pair of gray transitional weight pants to wear with a gray short-sleeved cable knit wooly cardigan and either a black turtleneck or a white shirt. I also found a deep, muted teal (very muted) jersey dress with a huge cowl neck collar. It sounds strange but I am happy to have a new dress and think it is pretty. I will wear it with black tights and my old Arche short olive green suede wedge boots and will feel very spiffy. I am but 53, barely dipping my toes in the over-50 pool, and yet in some ways I relate to your second paragraph. Perhaps having a significantly older spouse makes one look at aging and the stages of life differently. Anyway, I am moving to a small condo, am mostly retired, and am far less interested in things for themselves. I remain interested in what people wear and why, probably more the why, and love the process of dressing although I have become impatient with loot blogs as well. I don't quite know where I am going with this yet or how it will affect my own blog. As for this fall, I found it mostly uninspiring. Perhaps this is partly because I don't yet know what I will want in my new place, and partly because I have been looking at my wardrobe, which reflects years of accumulated pieces I love, and nothing I've seen so far thrills me as much as what is already in my closet, except for a pair of boots, which I was looking for anyway (justification). I think you have more appealing things to think about in your small post than in a huge stack of fashion magazines combined. Mardel: I would wait too, given the move, your current wardrobe and your estimable skills. Two evenings ago we went to a small club with visitors, crowd mostly students to early 30s, what fun to see what the young women wore... thift or inexpensive mash ups, no coordination and anything goes. Really fun people watching! Oh, sure. I'm certainly searching the blogosphere. But I'm more interested in your blog for the meta--the philosophy of fashion and style, and how that intersects with aging--than I am in the fashions per se. I don't see that there is much overlap in our personal styles, or our budgets, LOL. But I am interested in how you analyze things, how you come to the conclusions that you do. I'm interested in your process. I like how you think about these things even if I don't always agree with your conclusions. Does that make sense? Well, I couldn't verify that one way or the other. I was merely providing some second-hand information from the site you linked to, written by a person who bought, tried out and returned the item because it didn't work for her. I haven't actually seen the clutch in person, of course. One inch? That sounds pretty shallow; I don't think it would hold my car keys and--um, there must be a name for the door-unlocker-clicker- thingie--unless I took them off the rings and laid them flat. Maybe one of your other readers will buy it and report back at some point. Welcome back - I always get some good food for thought from your posts & miss reading you during August. This year I am thinning out some purchases from past years that were mistakes and replacing only a couple items. First up was a pair of boots that fit better than two pairs I purchased a couple years ago. Will be consigning the others... I also treated myself to a strand of freshwater pearls that are a stunning natural color and a slightly larger size than others I own. Scarves, though - are my standby wardrobe refresher to keep the black and grey going into a new year. They don't take up a lot of space and I find amazing ones on sale. Might have to search out a python print. One thing that did catch my eye that falls more into "trend" potentially is a polka dot cardigan at Banana Republic. Sometimes I find good basics there for work clothes (knit tops, simple skirts, etc.) - that sweater may come home with me if it fits well. PS - Enjoy France! Sounds like a fantastic time. HB: Thanks and nice to hear from you. Oh - that's lovely! I was just thinking about Bompard earlier today and meaning to peruse their site.